The author of this article is a student at the School of Journalism and Communication at The Chinese University of Hong Kong. The article is part of a collaboration between The Huffington Post and journalism schools around the world. HONG KONG -- Crowds form long lines for the rides at the Disneyland theme park here and an argument breaks out as tourists from mainland China try to cut the line. A local shopper gets annoyed when a sales assistant launches into Mandarin Chinese to serve her. A student watches, amazed, as a Mandarin-speaking mother thinks on her feet and helps her crying child pee into a plastic water bottle on a subway train. These are common scenes in Hong Kong as the city plays host to an increasing number of tourists from mainland China -- who are not only making headlines for bad behavior, but are also prompting changes to the urban landscape, as businesses strive to cater to the tourism industry. "They speak loudly in public, carve characters on tourist attractions, cross the road when the traffic lights are still red, spit anywhere and [carry out] some other uncivilised behaviour," Chinese Vice Premier Wang Yang said earlier this year, according to The Guardian. "It damages the image of the Chinese people and has a very bad impact." The National Tourism Administration in China even recently published a 64-page Guidebook to Civilized Tourism to educate Chinese tourists on how to behave abroad. "In one section of the guidebook, tourists were reminded that all air-conditioned places in Hong Kong and Macau were no-smoking areas," the South China Morning Post reported. "It also stressed that mainlanders should not try to get refunds for food." As China's rich become even wealthier, more and more of its citizens are traveling abroad -- 83 million made overseas trips last year, according to the United Nations World Tourism Organization. They spent a handsome $102 billion overseas, overtaking the Germans as the world's biggest tourism spender, the organization reports. And the majority of those trips are being made to Hong Kong. 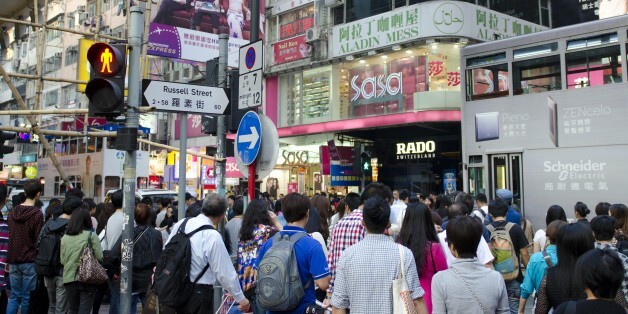 Since 2003, when tourism rules for visits to Hong Kong changed, residents of certain mainland Chinese cities have been allowed to travel to Hong Kong without being part of an organized tour group. Hong Kong was the top travel destination for people from mainland China last year, attracting nearly 35 million visitors from 49 cities, according to the China Association of Travel Services. That is roughly the equivalent of the entire population of Canada visiting an area similar in size to New York. Tourism has become a boon to the local economy, with visitors contributing more than 5 percent of the city's GDP last year, yet it has started to put pressure on Hong Kong's local community. The effects of the influx of tourists go even deeper than bad behavior -- the spending preferences of mainland visitors have altered the city's urban fabric and triggered feelings among locals that their culture and way of life are under threat. A quick walk around Causeway Bay, a central shopping district in Hong Kong, says it all. In less than 700 feet, Russell Street, one of the area's busiest, houses eight jewelry and watch shops, and there are about 90 more in the surrounding area. Taller offices, new boutique hotels and shopping malls are popping up in the least expected locations. What used to be a shopping district with a distinct local character has been transformed into a modern temple to consumerism filled with glass facades, massive LED screens and glaring spotlights for its Chinese worshippers. "It is changing so rapidly that every time I come back, I find it very different," said Gordon Chan, who lived in Causeway Bay for more than 10 years. Chan and his family moved away three years ago because the tenement building they lived in was torn down to make way for more retail space. In fact, Russell Street overtook New York's Fifth Avenue last year to become the world's most expensive shopping street. Prime real estate now comes with an annual rental price tag of $4,328 per square foot, almost 50 percent more expensive than Fifth Avenue. This may be good news for landlords, but many small, local shops have been driven out. Some of them, like one called Lei Yuen that sold noodles and congee (a rice porridge), had been a local fixture for many decades until it was shuttered in January. Another local favorite, Leighton Bakery, used to have hundreds of people line up for its famous egg-and-ham buns and iced milk tea, but it closed down in June. Many say they fear that the rapid disappearance of the local, independent storefronts will bring with it a loss of community and unique vibe. "Causeway Bay has already fallen," Chan said, when asked to describe how the area has changed. "You don't only see them [Chinese tourists] during Golden Week [the week-long Chinese National Day holiday] now, they are here all the time. You hear them walk by and there is always someone squatting outside the jewelry shops." Architect Raymond Fung Wing-kee, a member of Hong Kong's Advisory Committee on Revitalization of Historical Buildings, said he believes tourists from mainland China are not wholly to blame for the city's changing landscape. "It is our money-driven mentality that is stopping us from keeping a balance between tourism and local development," he said, adding that retail developers should look at the big picture to prevent structures like shopping malls from being built in every neighborhood. Tourism can be sustainable, he said, "if Hong Kong could identify its own unique character as a city and travel destination." CORRECTION: This article originally stated that Chinese tourists traveling abroad last year spent $102 million instead of $102 billion.